The constituents believed to be active in ashwagandha have been extensively studied.3 Compounds known as withanolides are believed to account for the multiple medicinal applications of ashwagandha.4 These molecules are steroidal and bear a resemblance, both in their action and appearance, to the active constituents of Asian ginseng (Panax ginseng) known as ginsenosides. Indeed, ashwagandha has been called “Indian ginseng” by some. Ashwagandha and its withanolides have been extensively researched in a variety of animal studies examining effects on immune function, inflammation, and even cancer. 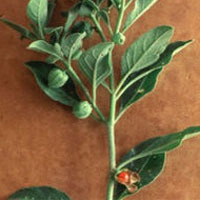 Ashwagandha stimulates the activation of immune system cells, such as lymphocytes.5 It has also been shown to inhibit inflammation6 and improve memory in animal experiments.7 Taken together, these actions may support the traditional reputation of ashwagandha as a tonic or adaptogen8—an herb with multiple, nonspecific actions that counteract the effects of stress and generally promote wellness.